On New to The Arsenal we'll look at the signings Arsene Wenger made during the Summer transfer window and look at each individual player's performance and analyse their input into the season so far. 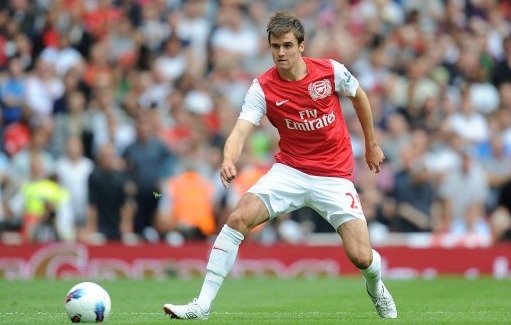 Today Joss Bennett looks how Carl Jenkinson has developed in the short time since joining his boyhood club. If someone had told Carl Jenkinson only a year ago that by Christmas 2011 he would have played in the Premier League, let alone the Champions League, for the club he has supported all of his life, he may have punched them for being such a tease. But here he is – with all of the above done – finally beginning to show signs that initial critics of such a seemingly random transfer may have once again underestimated Arsene Wenger. It hasn’t been easy for Jenkinson; he’s had to learn the hard way - with Bacary Sagna out injured - an 8-2 defeat and a sending off in the same game would be difficult for anyone to get out of their system, let alone a 19 year old who one year ago was playing in the Conference. Thrown in at the deep-end, Jenkinson struggled to stay afloat as the whole team suffered a dreadful start to the season. Many have criticised Arsene Wenger for protecting his players in public; refusing to openly pick on individuals. In a squad of young players, it seems completely counter-productive to set them up for a public battering – the problem is that people assume that if he doesn’t do it in public, he won’t do it at all. If this is true, it seems a remarkable coincidence that the team has suddenly hit form, including young Jenkinson whose last two performances have been confident and determined. Ultimately, by “protecting” his players, Wenger seems – for now at least – to have allowed squad harmony to develop without individuals feeling picked on. The combination of two of the newest players in the Arsenal squad on the right side of the Gunners’ defence should be a disaster waiting to happen but recently both Mertesacker and Jenkinson have shown significant progress. After a disappointing run of games against Sunderland, Marseille and Chelsea in which the latter received whoscored ratings of 6.15, 5.7 and 6.1 respectively, Jenkinson recovered to put in a solid performance as Arsenal drew 0-0 with Marseille at home. Against the nine time French champions, Jenkinson won three aerial duels (75% success rate) in addition to making one tackle, one interception and two clearances, without making a single foul*. In what was a somewhat uneventful game for both sets of fans, Jenkinson – and indeed the whole Arsenal defence – was more reserved, rarely bombing forward to support attacks. A solid performance against a prestigious team, followed by the visit of a struggling West Brom side with offensive injuries aplenty seems to have been the injection of confidence the young full-back, who is also eligible to play for Finland, needed to get his Arsenal career on track. Against a dormant WBA, Jenkinson was excellent when called into action at the back – making two tackles and one interception, as well as blocking one shot and making one clearance*. Jenksinson spent most of his time at the other end of the pitch, however, attempting eight crosses (though only completing one) **. Despite only finding his target with one cross, the chalkboard below shows how accurate his crosses actually were; getting almost all of them into the key danger area of the box. Jenkinson still has plenty to prove if he’s going to provide real competition to first-choice right back Bacary Sagna when the Frenchman comes back from injury. One or two performances don’t automatically make him exempt from criticism, but they do show the quality he clearly has. The international break will do Jenkinson good – a chance to get out of the spotlight and work hard to improve on his game. Jenkinson’s potential is raw, but if he can find consistency and build on his recent performances, he may well be the diamond in the rough Wenger is hoping for.